Blaine Construction Corporation worked with Tindall Corporation to build the Walnut Street Parking Garage in Knoxville, TN. 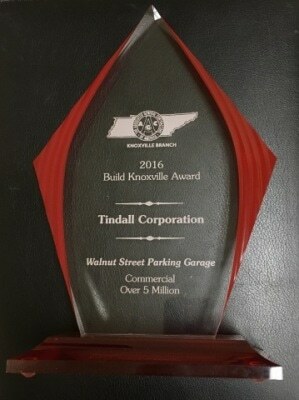 Blaine Construction and the Walnut Street Garage recently received a 2016 Build Knoxville Award in the category of commercial projects over $5 million presented by The Associated General Contractors (AGC) of Tennessee. The Build Knoxville Awards program honors AGC members who build the Knoxville region's most impressive construction projects based on criteria that includes state-of-the-art advancement, project management, innovation in construction techniques or materials, safety record, client service, community relations, environmental sensitivity and partnering excellence. Tindall Corporation collaborated with George Ewart Architects and Bender & Associated Engineering during project planning and design which set the stage for the project’s success. The eight-level parking garage includes over 1,000 parking spaces and more than 300,000 square feet of elevated precast concrete provided by Tindall. The building includes exterior architectural precast with a combination of inlay brick and sandblasted concrete finishes designed to blend in with surrounding buildings. The Build Knoxville Awards ceremony was held February 11th at the Commercial Real Estate and Construction Awards reception. Based in Knoxville, Blaine Construction Corporation provides general contracting and construction management services. Headquartered in Spartanburg, SC, Tindall Corporation is one of North America’s largest precast concrete companies with five locations providing design, manufacture and installation of precast, prestressed concrete structural systems, architectural cladding systems and underground utility structures. In 2015, Tindall ranked 5th in Engineering News-Record’s (ENR) Top 20 Specialty Concrete Contractors in the United States list and 77th overall in ENR’s Top 600 Specialty Contractors list.